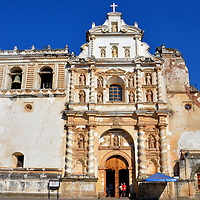 Antigua Guatemala in Guatemala is an awesome tour of Spanish colonial architecture built from 1543 until everything was destroyed by a 7.5 magnitude earthquake in 1773. This former capital city of the Kingdom of Guatemala was then abandoned. The ruins are fascinating in this UNESCO World Heritage Site.